As the game begins you take control of Eddie Valliant, with the framed Roger Rabbit cartoon character always following you. You must wander around an urban city of Hollywood entering various buildings, and caves in order to speak with people, some of whom are from the film, and pick up various items left on the ground and inside drawers and chests in order to find out who framed Roger Rabbit. The second half of the game takes you into the infamous Toon Town with more buildings and caves to explore in an effort to find Marvin Acme's lost will, and prepare for a battle with the neferious Judge Doom. 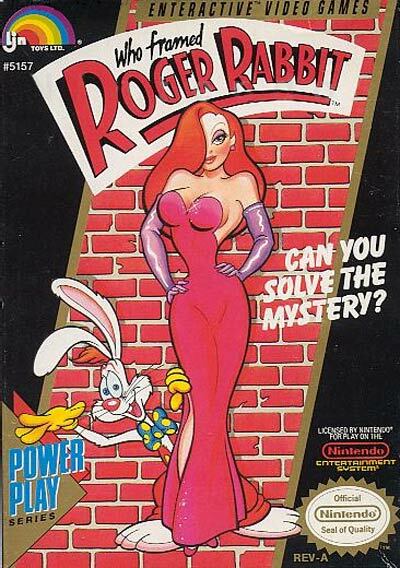 Beyond the challenge in locating items scattered throughout the various locations in the game, you must watch out for enemies that will deplete your life force or kidnap Roger Rabbit and end the game. Eagles will randomly swoop down and attempt to grab Roger Rabbit, if the Toon Patrol kidnaps Roger you only hope is to correctly answer their riddles and then escape while they are laughing. You also must face various enemies, some of which can not be killed, such as bottomless pits, snakes, rats, dogs, and walking cartoon shoes. The final battle with Judge Doom takes place in the Acme factory. There are an assortment of weapons that you can find or buy, and a password feature to save your progress. Benny the Cab can become your venue of transportation, and most of the major settings from the film are recreated in the Nintendo version of the game.